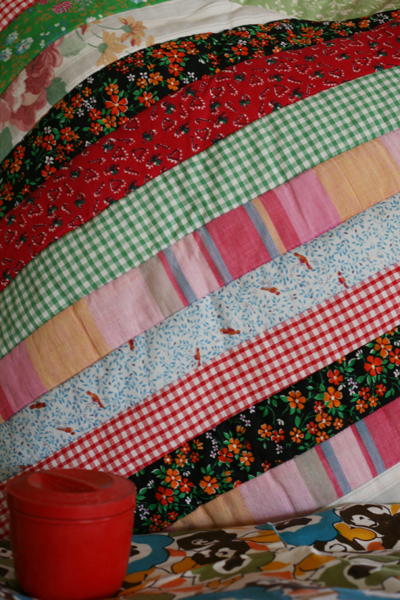 and a cute little patchwork cushion...plus a tiny little red Bakelite jar. One cant have enough cushions hey! i did the exact same thing this week and scored some awesome fabrics for the swap! Will post today. Love that cushion, and i say you can never have enough cushions too... although everyone else in my house disagrees! I also found some goodies at the op shop today to add to my stash for the swap. I love it when I see something that is so perfect I almost hyperventilate...and the excitement of knowing it will be mine in about 50 cents time is so delicious! I have two lovely pieces of retro fabric on the line blowing in the breeze right now.